Elsewhere, Ken has said the best use he can think of for a set of pedals on an old organ would be to control the base frequency at which a sequencer is running. He is forever having to abandon whatever chord he is playing to reach up and tap the keyboard controlling the sequencer. On the other hand, he is quite capable of playing the organ pedal board, but don't because the sequencer is running his bass line. Other DIYers have suggested creating a miniature "calculator" style keyboard that would allow them to pick out a tune on a small hand-held module. ken can think of the advantages of having such a keypad permanently built into the control panel of synth too. This module can be used for both of the above purposes, and any other that requires a keyboard of around one octave range. 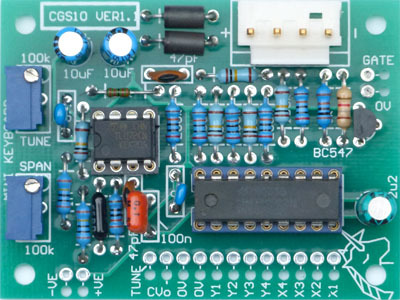 Connect the output to a VCO or similar voltage controlled device. Hitting a key/pedal will push the output to that voltage, and supply a gate pulse for as long as the key is held. It's behavior is very much like any of the older monophonic keyboards. If you have set it up with a calculator style keypad, try connecting the output to a VCA. That will give you a push-button volume control. If you are running a sequencer or wavetable that has voltage controlled selection of sequence length, waveform or whatever, you would have push-button control of that function. The schematic of the Mini Keyboard Ver1.1. By far most of the work is done by the Keyboard scanning chip, a 74C922. This chip is perfect for the job. It scans keys arranged in a 4x4 matrix, and when one is pressed, transfers a binary value corresponding to the button pressed to its data outputs, and also sends its data available (DA) output HIGH. When the key is released, the DA line returns to LOW, but the latched key data remains on the data outputs. An R/2R resistor ladder converts the binary data into a voltage. This is buffered using a traditional two stage op-amp buffer. Adjustments are provided for Tune and Span, so the output can be zeroed, and the span set to 1 volt per octave. There is an additional 1M resistor so an external tune pot (100k linear) can be added. Note that tuning voltage is up-side down: taking it positive will send the frequency down, so wire the tuning pot accordingly (CCW end to +VE and CW end to -VE). The data available output is buffered using an emitter follower, and will give a gate signal that goes between 0 volts and around 14 volts. How to wire the board. If using 1/4 or 1/8 jacks, run wires from the 0V pads to the jack "sleeve" connections. The best way to tune this is to play the lowest "C" (results in 0000 binary at the output of the chip) and set the TUNE trimmer so the CV output reads exactly 0 volts. When this is done, play the high "C" (results in 1100 binary at the output of the chip), and adjust the SPAN trimmer until the output reads exactly 1 volt. You may then adjust the TUNE trimmer again to offset the output to whatever voltage you require. While untested, the module should work on +/-12 volts. Use 1k5 for RA.